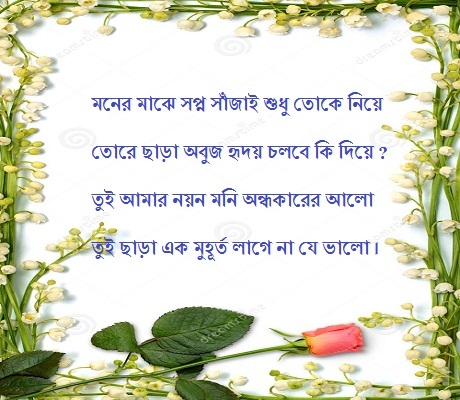 The best romantic bangla shayari is here waiting for you. Today i am giving you some romantic bangla shayari to take more love from your girlfriend. If you love your girlfriend and want to give something special everyday, then these romantic bangla shayari for you. We know all couple want to share something special with each other. 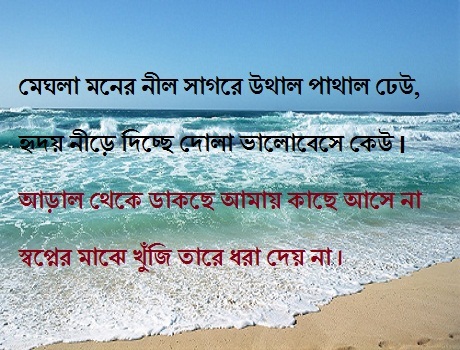 If you give these romantic bangla shayari your girlfriend or boyfriend. You will get return of something other special from your love. So these sms can help you to make your relation more romantic and cute. Also your love will be more trusted for each. You will get more romantic bangla sms on our other post. 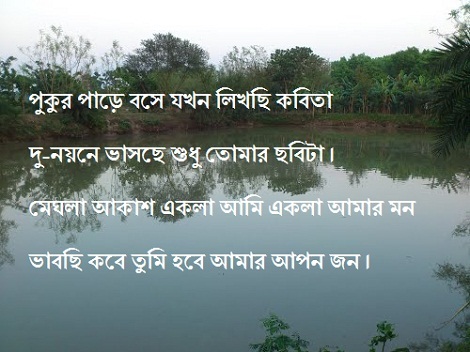 Jodi thako amar Ridoy ghore valobese amay. Jodi tumi ducokh rakho amari ducokhe. dui noyone vashche shudhu tumar chobiita. Vabchi kobe tumii hobe amaar apon jhon. Boro Besi Valobasi Ami Tomay. Ek Mutho Prem Jodi Dao. Ei Tomake Apon Kore Nebo. Megla Moner Niil Shagore Uthal Pathal Dheu. Ridoy Niree Dicche Dola Valobase Keu. Araal Theke Dakee Amay Kache Ashe Na. Shopner Maje Khuji Tare Dhora Day Na. Jhibone Morone Thakvo Pase, Vullbona tumay..! bhabtey dekho tumar du chokh jhure kivabe ojhosro kanna ashe. ki korre vabbee tumii amii hina tomar jhibon, karon tomaar oii montar sathe badha jee amaar ei Monn..
Tore Chara Obuj Hridoy Chollbe Ki Diiye ? Tui Cara eek Muhurtho Lagena je Valo. Tumii amaar obuj pakhi valobasar jan.
Tomay chere kemon koree bachee amar pran. Sotty Tomay valobasi ogo janer jaan. Tomar jonno diiye dibo aamar obuj pran.